This column contains a correction. The Senate-passed measure to keep the government operating represents an enormous compromise by progressives to avoid a damaging government shutdown. The Democrat-controlled Senate agreed to temporary funding levels that are far closer to the Republican-controlled House budget plan than they are to the Senate’s own budget for fiscal year 2014. Moreover, this concession is only the latest of many such compromises over the past several years. The Democrat-controlled Senate passed a continuing resolution, or CR—a temporary funding measure meant to keep the government operating—that would set the relevant funding levels at an annualized total of $986 billion. That’s about $70 billion less than what the Senate endorsed as part of its comprehensive budget plan back in April. But that actually understates the extent of the compromise. When President Barack Obama first took office in 2009, his budget proposed $1.203 trillion in discretionary spending for FY 2014. The Senate CR is about $216 billion, or nearly 18 percent, lower than that. Actual enacted funding levels for FY 2010, when the Democrats controlled both chambers of Congress, totaled $1.185 trillion in 2014 dollars. The Senate CR is about $200 billion below that, a cut of nearly 17 percent. Finally, in August 2011, after a prolonged standoff over the debt limit, President Obama and Congress agreed to cut even more spending than the original Ryan budget demanded. 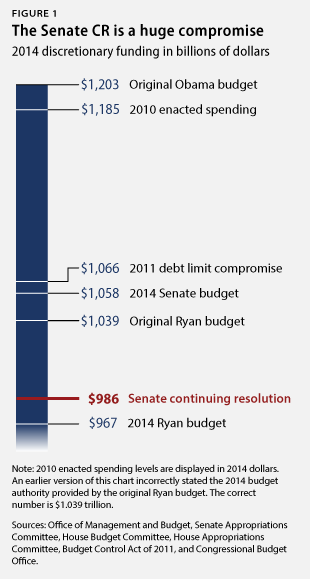 The original spending caps in the 2011 debt limit deal limited funding to $1.066 trillion in FY 2014. 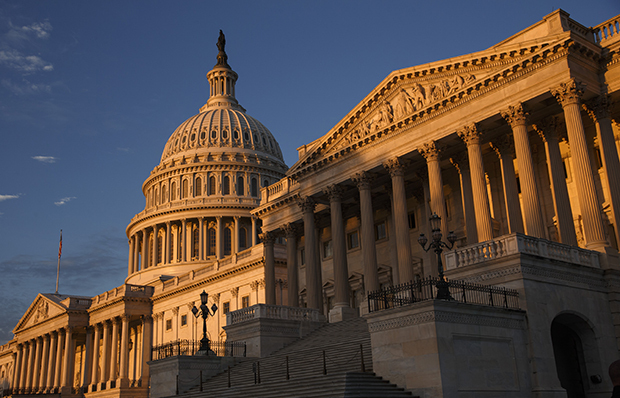 The Senate CR accepts a cut of an additional $80 billion, or nearly 8 percent, from that compromise level. Progressives have repeatedly made significant concessions in order to protect the economy from a series of manufactured crises. Today’s manufactured crisis is no different. The Senate-passed legislation to keep the government open sets funding levels that are even lower than previous compromises. If the Tea Party shuts the government down anyway, it will not be because progressives were inflexible. Just ask House Speaker John Boehner (R-OH)—the compromise incorporated in the Senate CR was originally his idea. Michael Linden is the Managing Director for Economic Policy at the Center for American Progress. Harry Stein is the Associate Director for Fiscal Policy at the Center. *Correction, December 11, 2013: This column incorrectly stated the fiscal year 2014 budget authority provided by the original Ryan budget. The correct number is $1.039 trillion.